Received today thru email and it is really a GOOD NEWS to us NUFFNANGERS! ...possibility of lowering the cash-out threshold of your earnings from Php2,000.00 to Php1,000.00 or allowing cash-outs of all earnings above Php500.00 by the end of each calendar year. We are looking at either one of the options so that you can enjoy your earnings much earlier. 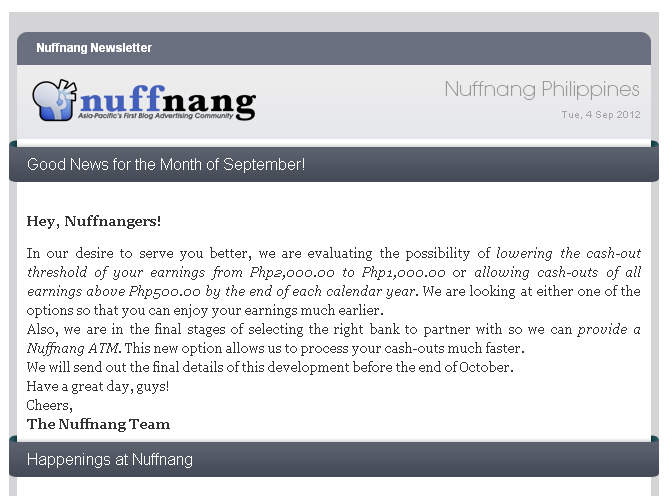 Also, we are in the final stages of selecting the right bank to partner with so we can provide a Nuffnang ATM. This new option allows us to process your cash-outs much faster.